Yesterday was Bebo's turn, but today was mine. Not a new boa, but some new babies that I am crazy about. For now, they're still nameless but I'm working on it. 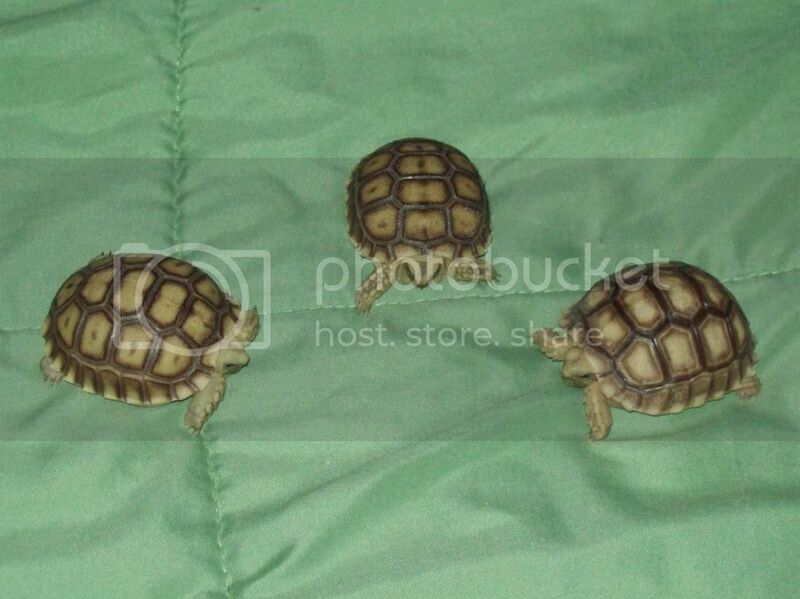 Inside - the 3 new sulcata tortoise babies that Bebo bought me. They are so cute. Ben got them from salmonboas.com, of course he was purchasing another snake when he came across them, but that's fine cause I got new tortoises. Sorry for the way I look, I had just woke up before they got here. The three new nameless babies. They're so little and so cute. 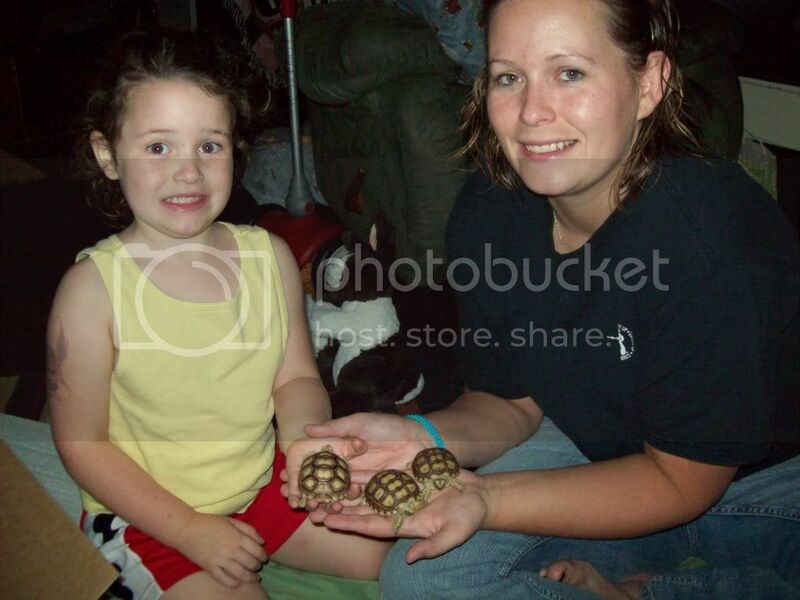 Here they are with our three year old sulcata Shelby (who needs a bath by the way). 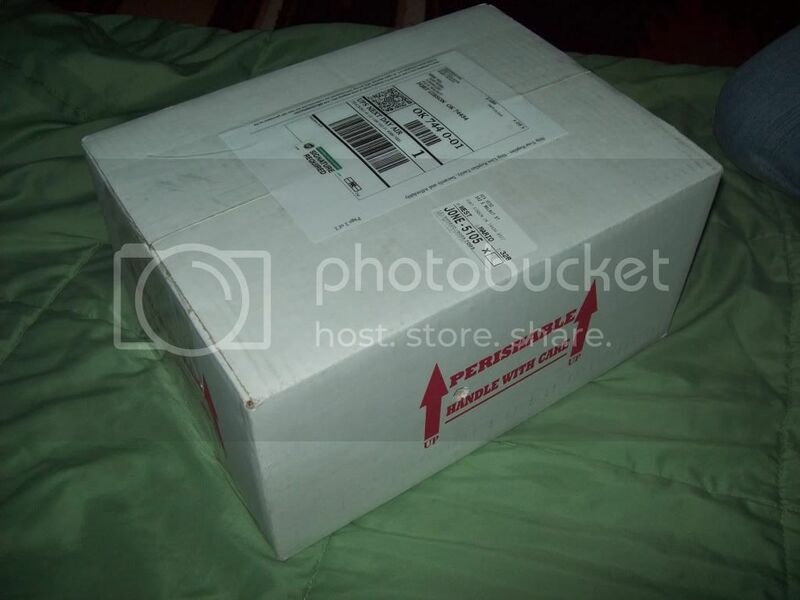 Sorry guys, Bebo moved the pictures to a folder in the Photobucket account after I posted the thread. It made the picture link invalid. But, it should be fixed now. That is sweet. congrats on the new babies! awww cute, how big do they get? and what kind of cage you keep them in? Yep, this one was my fault guys, I do appologize. The sulcata tortoise is the third largest tortoise species in the world. On average, the adult's shell length varies between 18 to 36 inches and weigh, on average, 70 to 150 pounds. I know, quite a varience for an average, right? However, John at salmonboas.com told me that he has a 300 pound male. WOW! They also live 50 to 80 years, so they are literally a life time companion. I have these three babies in a large Rubbermaid container with a hide at one end big enough for all of them to get in to, a very shallow water dish in the middle that allows them to crawl into it without getting high-centered on the edge, and is empty at the other end for basking under the lamp. 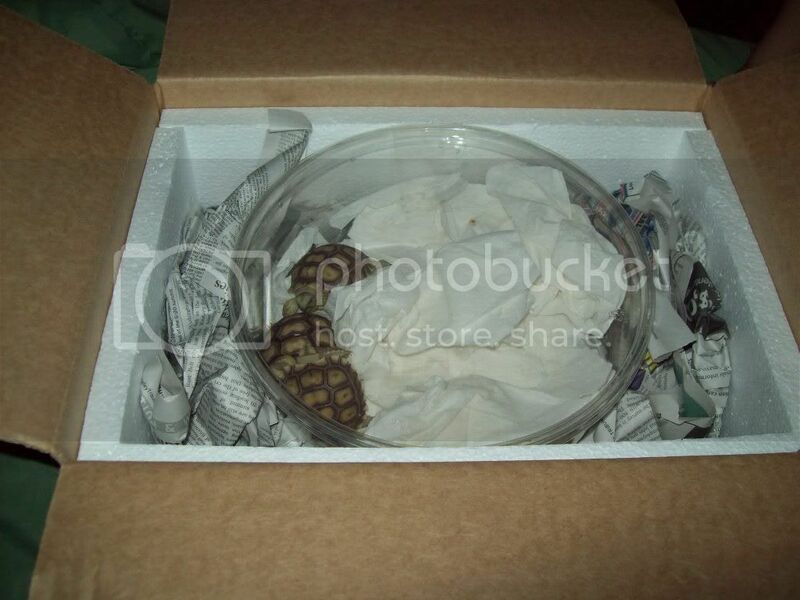 I have the 3 year old sulcata in a round plastic kid pool, like the $5 kid pool from Wal-Mart. But, it's basically set up the same way as the babies. As they continue to grow, you have to upgrade your enclosures. When they are adult sized, I will actually construct them a heated house type building with a fenced in yard for them to roam. That's so cool! And although this can be said about any small creature, my wife has wanted one of those for a while now. I think it'd be sweet, but with three cats and a dog roaming the house, I feel like it might not be such a good environment for one. Congrats on yet another pick-up! Believe it or not, once they get bigger, it's actually the dogs or cats that would have to worry. One of their defense mechanisms is to tuck in their head and ram what ever they feel is the threat. It's kind of funny actually, but it definately works. Cool little guys!! I have always wanted some! Girl, whatcha talkin about...YOU LOOK JUST FINE, and i LOVE YOUR TATT!!! Now your mom looks like she had just woke up....o wait, who was the one posting this? You look just fine mama. I would call those little ones Curly, Larry and BeMo! I DO have to ask though, i noticed on your 3 yr old how their sections grow outward peaks and they have rings...i am taking it that it doesnt represent age, like rings on a tree...but would they indicate anything? Very cool tortoises. I talked to a breeder at a local show a couple months ago. He lives in Florida and has a decent size farm. He said he has about several acres fenced off just for his sulcatas. He said they roam freely and that he has to search for the eggs because they just lay them where they please. He mentioned that they aren't that great of a house pet and he also said he has a few that weigh over 200 lbs. I hope you have plenty of room for them. Congrats on the new additions!! 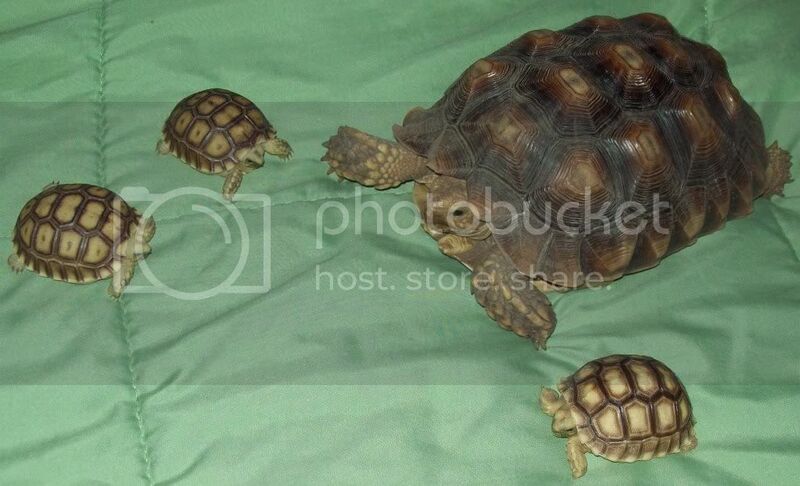 I always thought it would be cool to have a Sulcata but their eventual size and rediculous life span (I would have to leave it to somebody after I die! LOL) keeps me from it. You need to post lots of pics of them for me instead! LOL! Oh BTW, no apologies needed, you look just fine girl. lol... thanks E. The peaks are due to their inability to metabolize protein very easily. They need a lot of UV light to help and of course a low protein diet. We were giving a little too much protein with the pellet food and a little too much time outside as a baby. We've evened it out now and the peaks are slowly going down. Hopefully we'll have them flattened back out before too awful long. It's all about preference. Some people have acres for their torts to roam, some use a back yard, some make a specific sized enclosure. It just depends on what you have to work with and how large of an area you want to give them. Their's one lady close by who dedicated a room of her house with an outside door. She even cut a 'tortoise door' rather than a doggy door to allow them access to the back yard. We're waiting until they're a good bit bigger before we section them off a part of the yard. I'm sure we'll be handing down plenty of animals in our wills whenever that day comes. We're pretty lucky that all 6 of our kids are animal lovers, and one of our boys specifically is our nature freak. He would gladly take all of our animals when that day comes. I think he meant much too little. We weren't getting Shelby outside as much as we should have been, but he gets outside a lot more now.